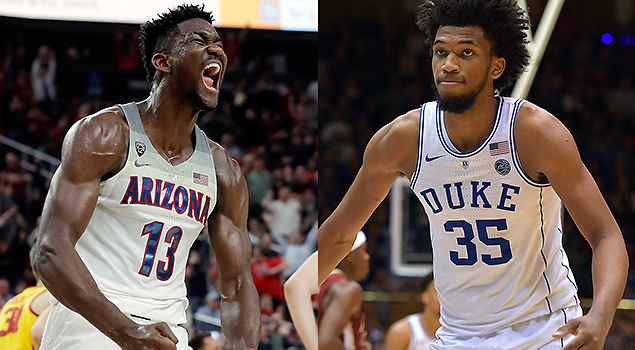 This year’s NBA draft may not have a LeBron James or Kevin Durant or a Steph Curry but it has plenty of very gifted young prospects who have the talent and pedigree to could contribute right away for a lot of teams, and may even become the face of a franchise. 2-Marvin Bagley III, 6-11 235, C-F, Duke – Bagley, whose dad played for the Arizona Rattlers, is just a notch below Ayton in terms of talent, but the Duke product has a skillset that many NBA teams crave. Bagley is a face-up big man who can knock down long-range jumpers and handle the ball above the foul line. He is an ideal perimeter forward or stretch 4. He reminds scouts of Chris Bosh. A lefty who can space the floor who can also play the 5 if needed. Bagley averaged 21 points, 11.1 rebounds and shot 61.4% in 33 games at Duke. He was named ACC Rookie of the Year and first-team All-American. Bagley established himself as a lottery pick with an outstanding performance during the PK80 tournament in Portland when he scored 34 points and grabbed 15 rebounds against Mohamed Bamba and Texas. Bagley reclassified himself in high school at Sierra Canyon to allow him to be eligible for the 2018 NBA draft. He won’t turn 20 until March of 2019. Whichever team drafts Bagley may not get his full potential until his body fully matures. But when it does, he could be a future NBA All-Star. 3-Michael Porter Jr., 6-10 215, F, Missouri – A year ago, Porter’s name was atop many draft boards as the next can’t-miss prospect. He was the consensus high school player of the year and preseason college All-American. But a lower back injury that required surgery adds a bit of mystery to his NBA future. He came back to play three games for Missouri but looked real rusty. Some scouts thought he would have been better served taking the entire year off and not risk further damage to his back and to his draft stock. But give Porter credit for fast-tracking his rehab to get on the floor for his college team. He is a physically gifted player who fits in well in the modern NBA. At 6-10 and 215 pounds with a 7-foot wingspan, he can play on the wing or center and his handles are above average for a big man. Porter is extremely versatile. He has a unique ability to grab a defensive rebound and lead a fast break. Porter doesn’t do one thing great, but does many things well. His weakness is on the defensive end, as he might struggle against quick guards coming off screens. There’s a high risk, high reward label with Porter. The reward appears to be greater than the risk. 4-Collin Sexton, 6-2 185, PG, Alabama – The ultra-competitive Sexton could very well be the best point guard prospect in the draft. Oklahoma’s Trae Young, who is just outside of this top-eight list, is getting the most of the attention from the media, but Sexton has the most upside. Sexton is a dynamic player who plays with a lot of passion. When he’s locked in, he plays on a different level because of his excellent burst. He has the ability to destroy a defense without the benefit of a screen. He learned under former NBA point guard Avery Johnson while at Alabama. “At the end of the year, he started to figure some more things out about defenses and being a leader on our team,” Johnson said of his point guard, who averaged 26.3 points in three games in the SEC tournament. He scored 40 points in a loss to Minnesota when Alabama was down to three players on the court. Johnson said Sexton excels in the pick-and-roll game and plays both ends. “A lot of attributes about his game translate to the NBA game,” Johnson said. Former NBA general manager Billy King said he loves Sexton’s speed and quickness, but he has questions about his jump shot. Some scouts are also concerned that Sexton allows his emotions get the best of him. Scouts had those similar concerns about Marcus Smart when he came out of Oklahoma State. He turned out to be an “OK” NBA player. 5-Mohamed Bamba, 7-0 207, C, Texas – The former Texas Longhorn is rising fast on many draft boards following a string of strong workouts. The big man has had a meteoric rise since the college season ended, and some are even projecting him to be in the top three of the draft. During one of his workouts, Bamba reportedly ran his three-quarters-court sprint in 3.04 seconds. By comparison, Russell Westbrook ran the same drill in 3.08 seconds. Whichever team picks Bamba, they will get an athletic, lengthy center who can cover some serious ground. Bamba checked in at the NBA draft combine with a 7-foot-10 wingspan, which is just slightly longer than Utah Jazz center Rudy Gobert’s wingspan. He also has shown an improved face-up game and jump shot to go with his ridiculous length. If Bamba can add an offensive game to go with his off-the-charts defensive ability, coaches won’t need to sub him out when teams go small. Player development specialist Drew Hanlen has been working with Bamba to improve his suspect jump shot, and a lot of NBA execs are liking what they’re seeing. Bamba averaged 12.9 points, 10.4 rebounds, 3.7 blocks and shot 60 percent from the field in 29 games at Texas. Charles Barkley has repeatedly said that anyone who can rebound in college can be a very good NBA player. 6-Luka Doncic, 6-8 225, G-F, Slovenia – The 19-year-old Slovenian national is considered one of the best international prospects to enter the NBA draft. His father Sasa played in the Slovenian League and EuroLeague, while his mom is a former model. He made his professional debut for Real Madrid at 16. Three years later, he became the youngest player to win EuroLeague MVP. Doncic played most of his EuroLeague career at point guard, but he’s projected to be more of a wing player in the NBA. At 6-8 and 225 pounds, he looks like a mini version of Toni Kukoc or Hedo Turkoglu. He has a great feel for the game and like many European pros he can flat-out shoot the ball with range. Doncic has supreme confidence in his abilities, and he won’t hesitate to embarrass you on the court. Now, before we go all-in on Doncic the elephant in the room needs to be addressed. He’s a classic European player, and outside of a few exceptions Euros who have not been exposed to the American-style of play have not fared well in the NBA over the last 20 years. Hopefully, Doncic won’t be another Jan Vesely or Nikoloz Tskitishvili. 7-Jaren Jackson Jr., 6-11 236, F, Michigan State – The son of former San Antonio Spurs forward and NBA champion Jaren Jackson Sr. is the youngest player in the draft. He won’t turn 19 until September and has an extremely high ceiling. He put up modest statistics as a freshman at Michigan State, averaging 11.3 points, 5.8 rebounds and 3.2 blocks, but he was overshadowed by sophomore teammate Miles Bridges. Jackson Jr. picked up his father’s jump shot as he looks like he can consistently knock down the 3-ball from NBA range. He was named Big Ten Defensive Player of the Year and Big Ten Freshman of the Year. He got better and better as the season wore on, and showed flashes of being a good “3-and-D” player at the next level. What that means is NBA teams are looking for perimeter players who can hit 3-point shots and lock down on defense. 8-Mikal Bridges, 6-7 210, F, Villanova — At 21, Bridges is one of the oldest players in the lottery but he also the most decorated. He won two national championships at Villanova. Bridges is somewhat of a late bloomer. He greatly improved his draft stock with an outstanding junior year. After averaging 9.8 points during his sophomore season, Bridges doubled that total as a junior averaging 17.7 in 40 games. “He’s the kind of player many teams would love to have in that wing role of three-and-D,” a Western Conference NBA scout says. “He’s a guy that can be a 10-year-plus pro with his style of play.” Bridges is a solid two-way player who reminds some scouts of another Villanova star, Kerry Kittles. Bridges is a plug-and-play player, who can help a team immediately.